Now is a perfect opportunity for seasonal home maintenance, such as changing your air filter. This is especially important during the fall season as many allergies begin to worsen. When it comes to buying the correct air filter for your house, there are three questions you should ask. 2.) Has my HVAC Unit been maintained properly? Be sure your air and furnace system is well maintained before installing a new filter. A system that has not gone under a regular maintenance schedule will negate any affect a new air filter can have in your home. You should also keep in mind that older systems are not usually designed for higher grade filters. Be sure to check with a professional about which type of filter you should use. 3.) Will this filter help my allergies? Not all air filters are specifically created for removing allergens in the air. If you suffer from severe seasonal allergies, installing a filter designed to remove many indoor allergens will be a wise decision. 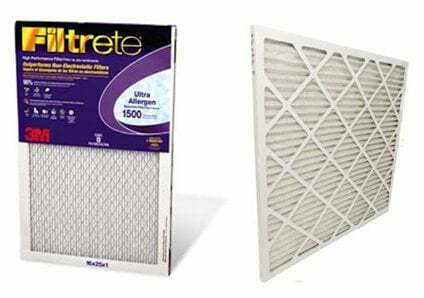 Consider the Filtrete Ultimate Allergen filter or the Filtrete Micro Allergen Air Filters, which will both effectively reduce many airborne allergens from circulating in your home. After carefully considering the answers to these three questions, you are ready to purchase your next air filter. As always, if you have any questions or concerns feel free to contact our Customer Service department at 866-438-3458. We are so glad to hear this! Please let us know if we can help you in any way in the future. Your answer to my question about which way to place a furnace filter, was “the best, easiest one” to understand. I am a gal and manage fine alone, but there are still some things that are confusing to me. So,” a big thank you” to making this answer so understandable. My wife and I are trying to get our house ready for the winter, but we aren’t sure how to choose a new air filter for our furnace. I liked that you mention how older units might not be designed with newer filters in mind. We’ll have to check what kind of filters it takes before we buy one, in this case, assuming it’s an older model. Thanks for sharing! I do like that you encourage people to make sure their HVAC unit is in top condition before buying a new filter. An HVAC system that is malfunctioning or inefficient might dirty the filter much faster than usual. No one wants to waste money on filters that should be lasting longer than they are, so it is important to make sure that it isn’t the unit that is the problem. I never knew that you should consider if the air filter is going to remove allergens from the air. My wife has a few allergies that she seems to not be able to get rid of, and we weren’t sure how to help. It sounds like she might want to get something like this.